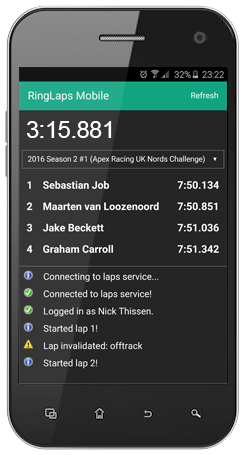 The Timer application automatically times your laps and uploads them to the online database. It also shows live standings and laptimes from your rivals. Everyone participates in one big Global Series, competing for that one best lap in equal and fair track conditions. Organize your own custom leagues and events to drive against your friends, teammates or rivals. Customize rules like track conditions and point systems.